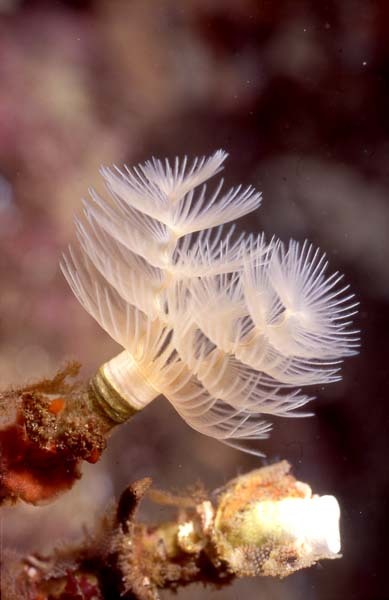 The Class Annelida consists of the segmented worms - divided into the polychaetes, oligochaetes and the hirudinea (leeches). 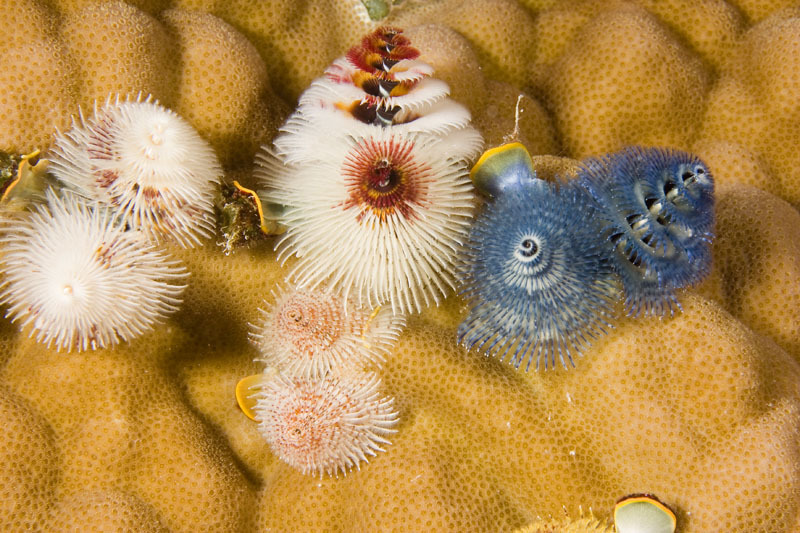 Currently all of the species shown below are polychaetes - so at some time in the not-too-distant future I will set this up as a polychaete page and make new pages for oligochaetes and leeches. 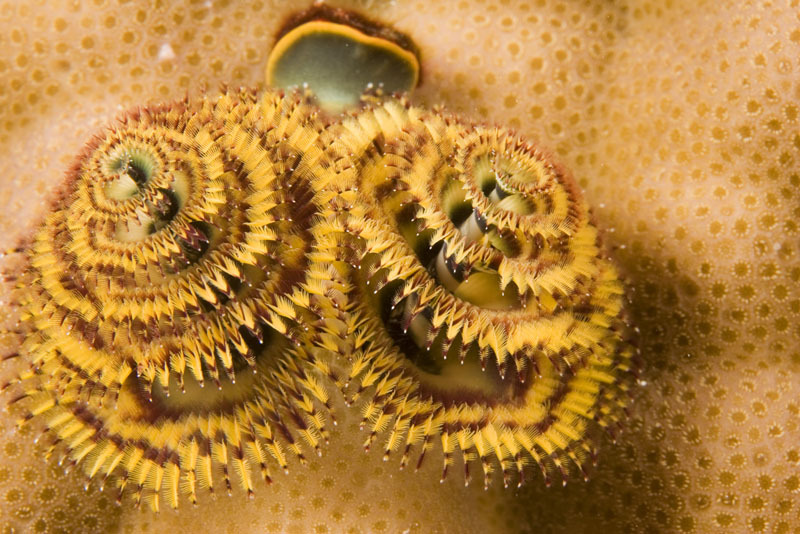 The polychaetes are typically marine, although they are found in other environments such as in freshwater, caves or even the leaf axils of Pandanus trees. 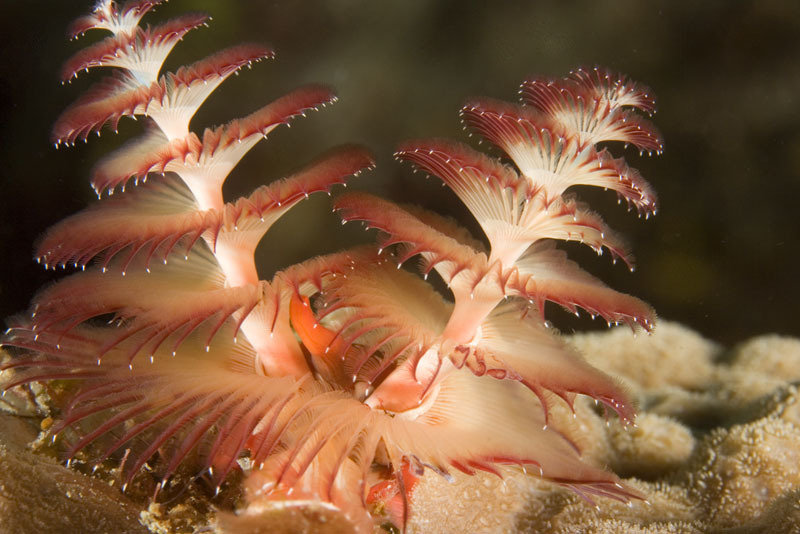 Most are less than 10 cm but some such as the bobbit worm (I leave it to you to work out their common name) can grow to 2m. 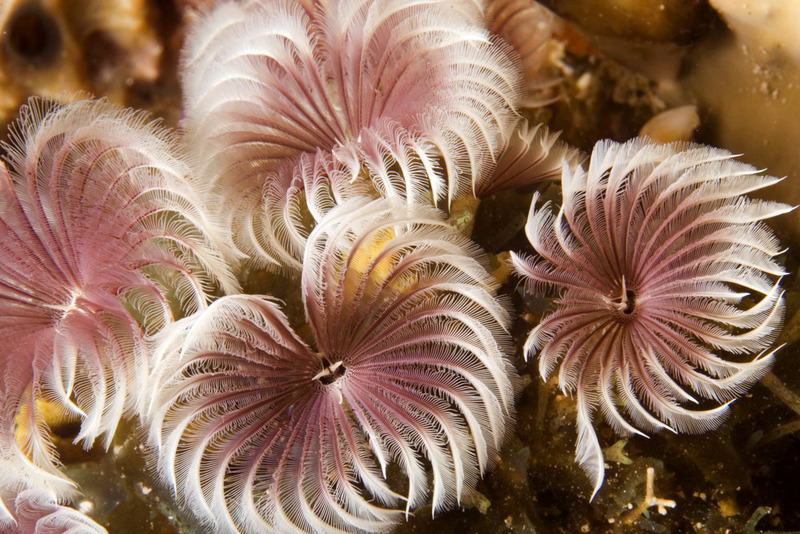 The polychaetes can be divided into those that are sedentary and those that are free-swimming. 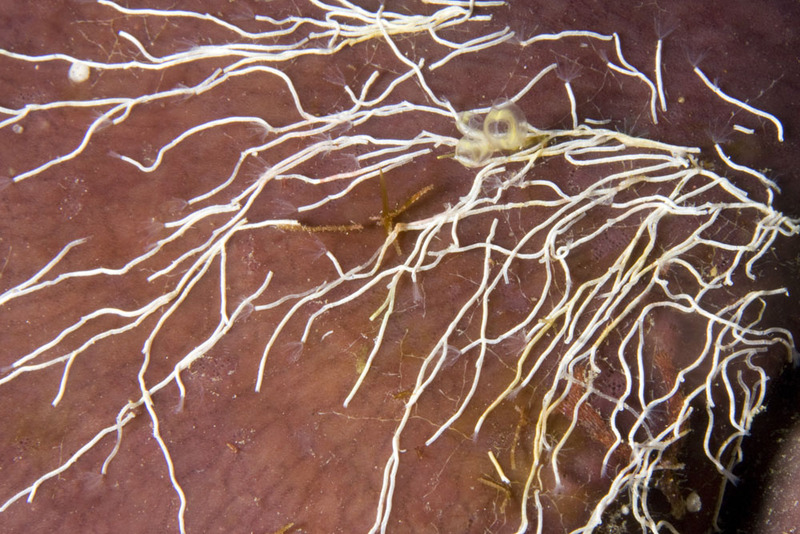 The sedentary worms typically build burrows and/or protective tubes. 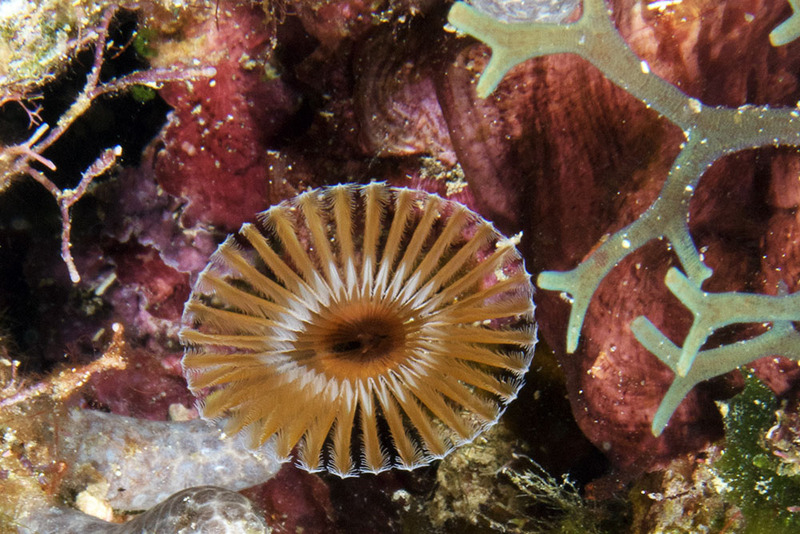 The tubes may be calcareous or parchment-like. 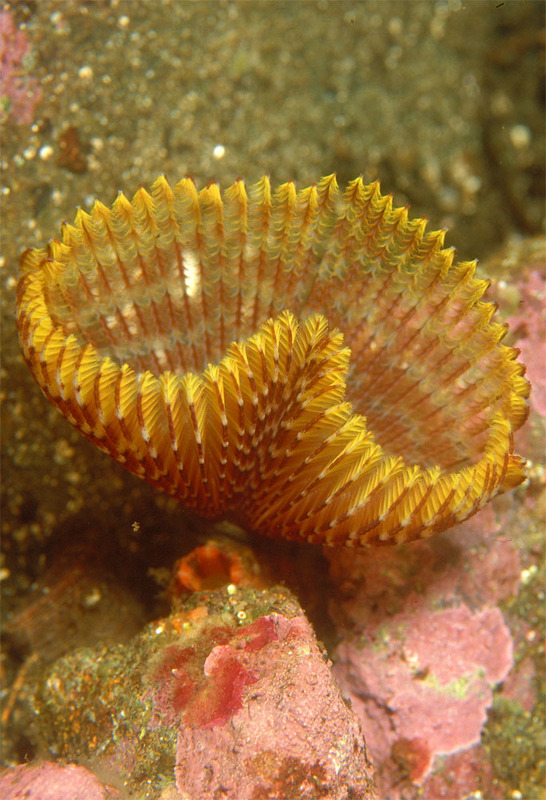 The sedentary species normally possess elaborate gill structures which double as feeding organs. 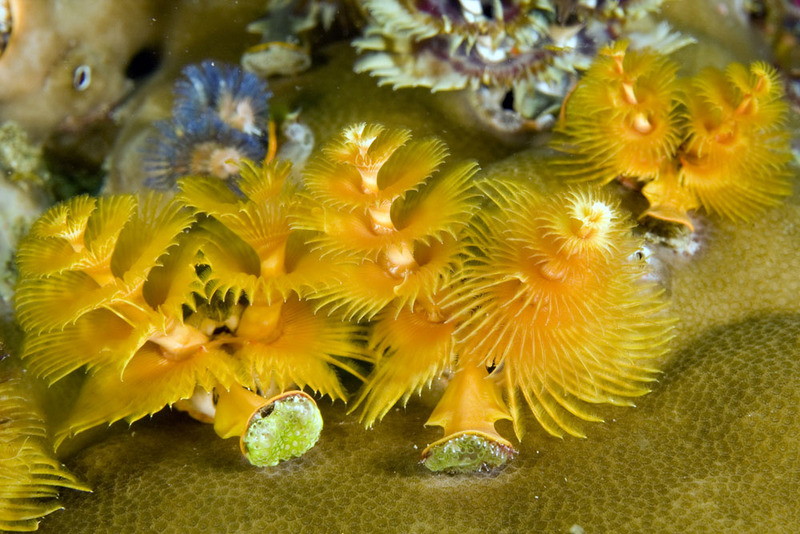 The best known of these are the Christmas tree worms, Spirobranchus species. 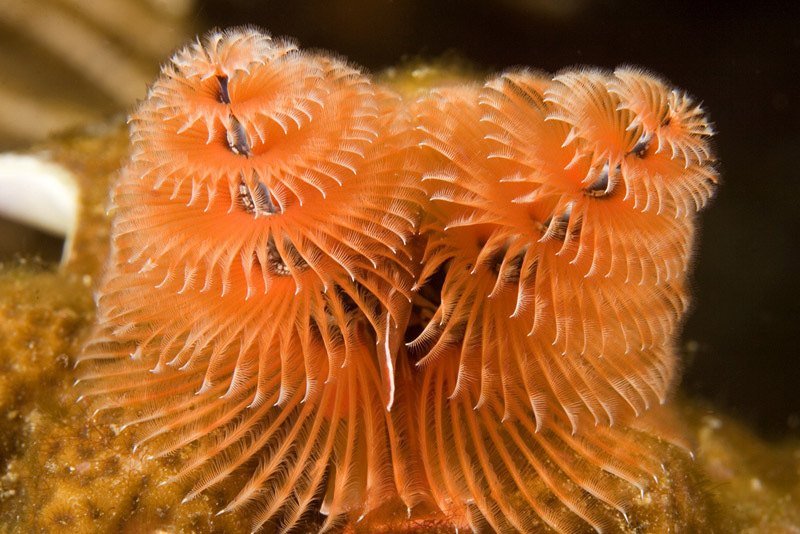 I used to identify every Christmas tree worm as Spirobranchus giganteus but recently read that this is a complex of at least 10 species which are indistinguishable from photographs - so take the S. giganteus identifications with a grain of salt. 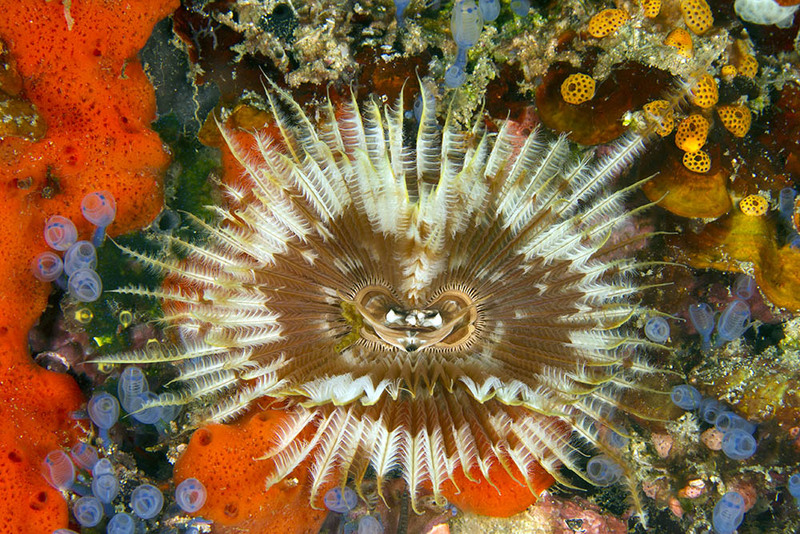 When the worm is threatened their eyes detect the movement and the worm withdraws into its tube and slams a trapdoor down over the entrance - cool trick. I have video of one emerging - pretty cool (but the clip is 85Mb - may take a while to download). 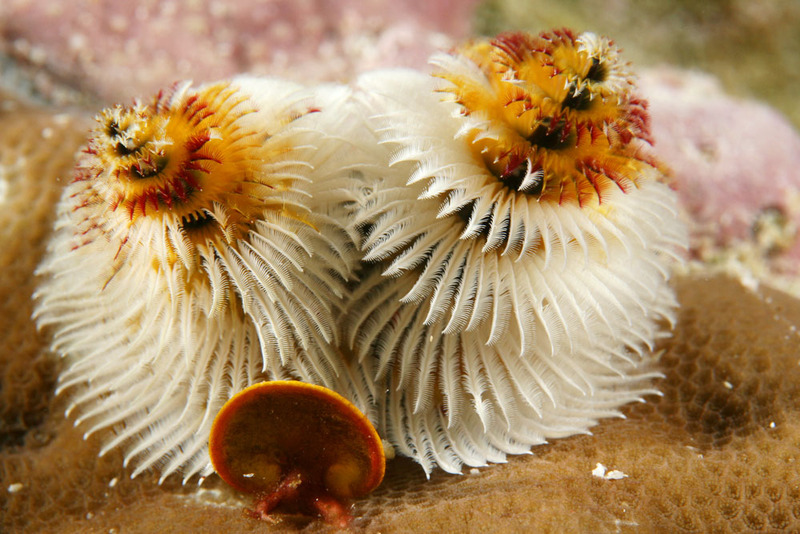 In both the Caribbean and the tropical Pacific (but best known from the latter) there is a mass spawning event of polychaetes. 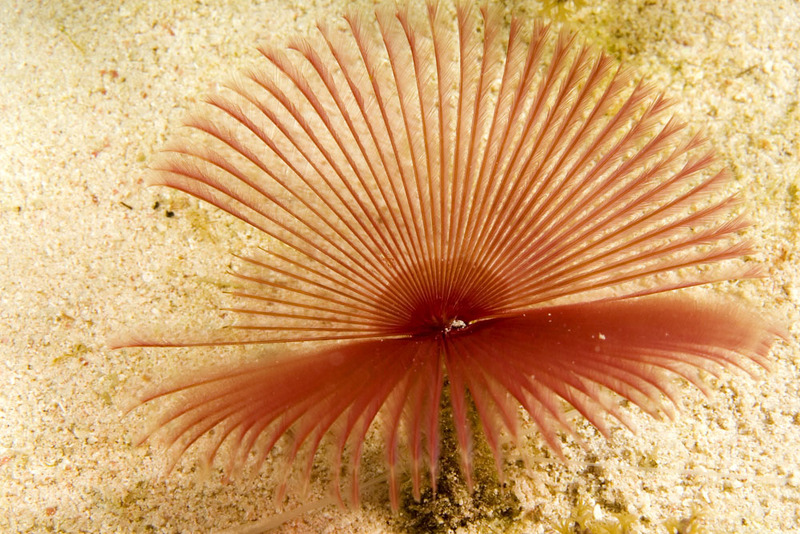 The adult worms themselves remain safe within their burrows/hidey holes (technical term used rarely by biologists) but develop and subsequently release a reproductive structure known as an epitoke. 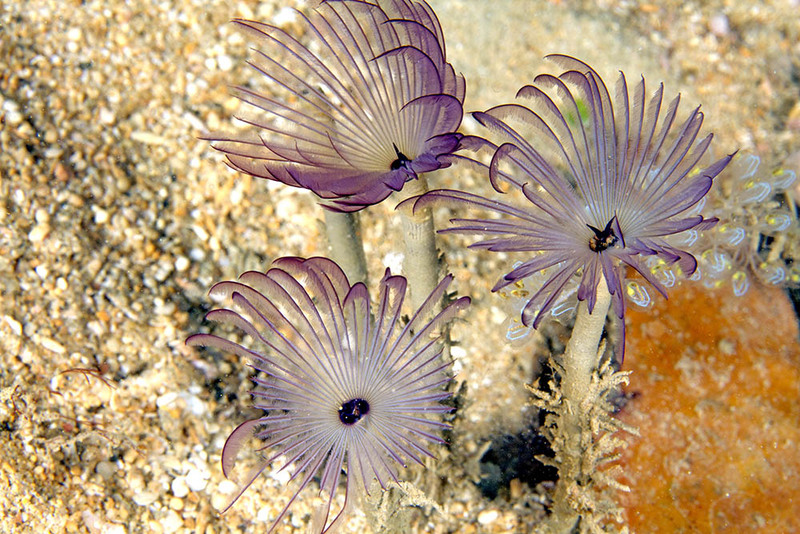 The epitoke, packed with either sperm or eggs, breaks off from the adult and uses functional eyes to swim to the surface. 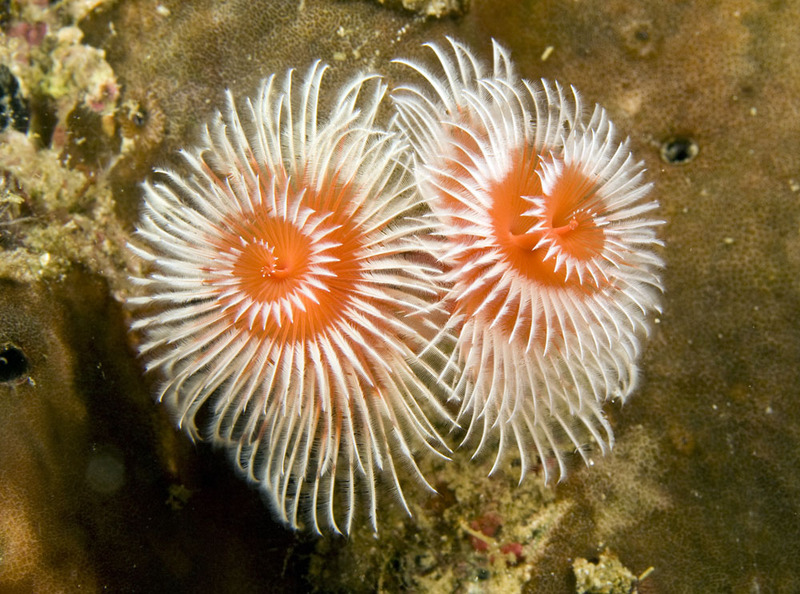 At dawn, or just before, the epitoke bursts open releasing eggs and sperm into the water. 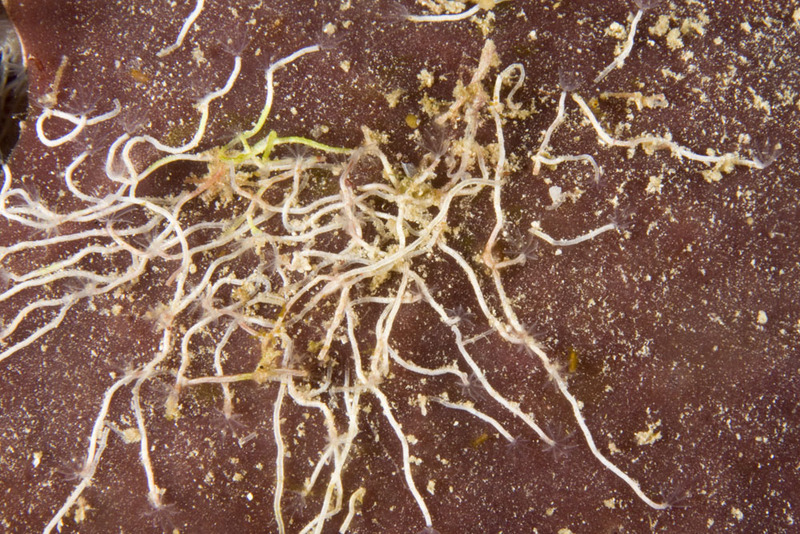 So many worms do this that they overwhelm predators so some of the eggs produce larvae. 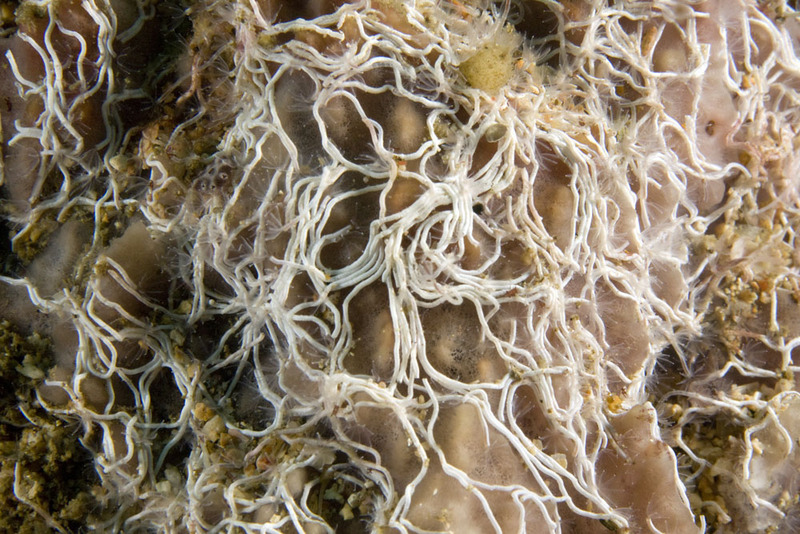 This is the biological "Big Bang Theory" and several other marine groups do this - most notably the mass spawning of coral. 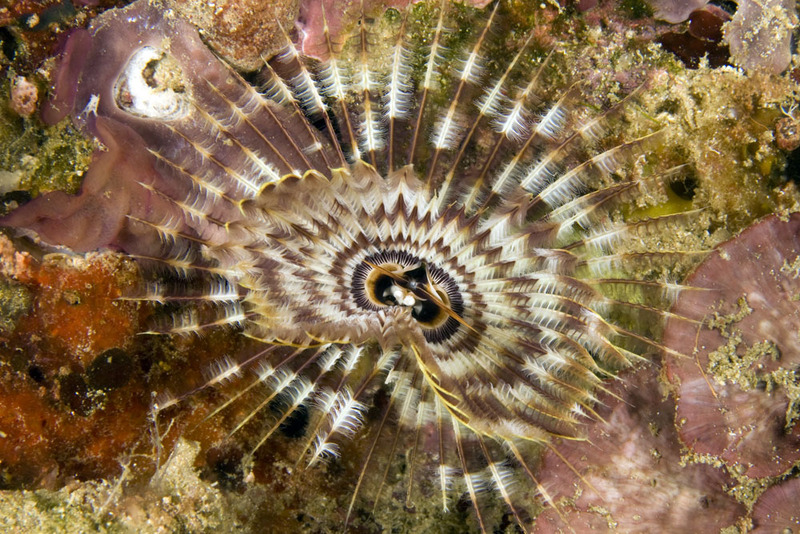 In the Pacific the epitoke (balolo or palolo depending on where you are) is considered a delicacy. 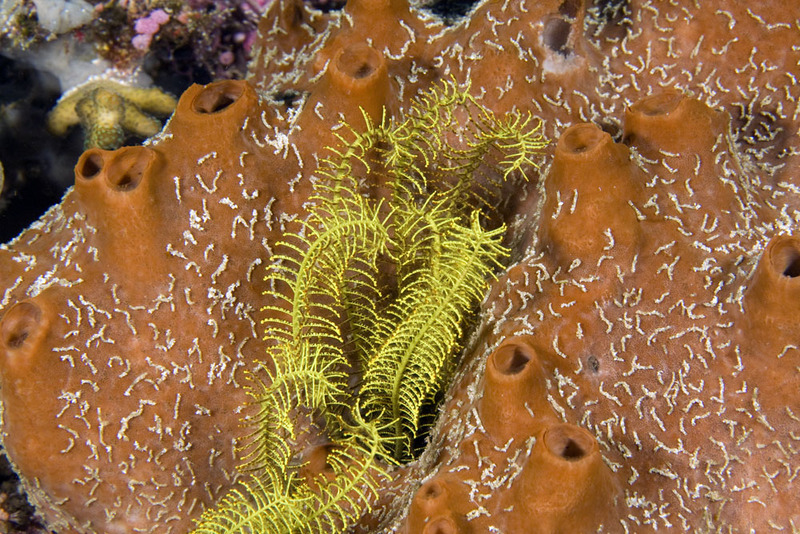 The main species involved is Palola viridis. 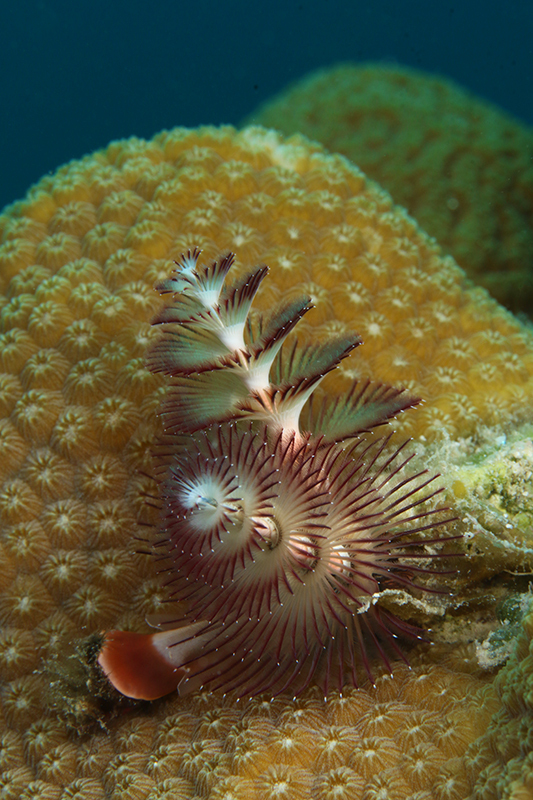 I was once fortunate enough (or unfortunate enough depending on how you view massive numbers of worms) to witness this in Belize - for reasons which I can no long recall I gave this event a page of its own. 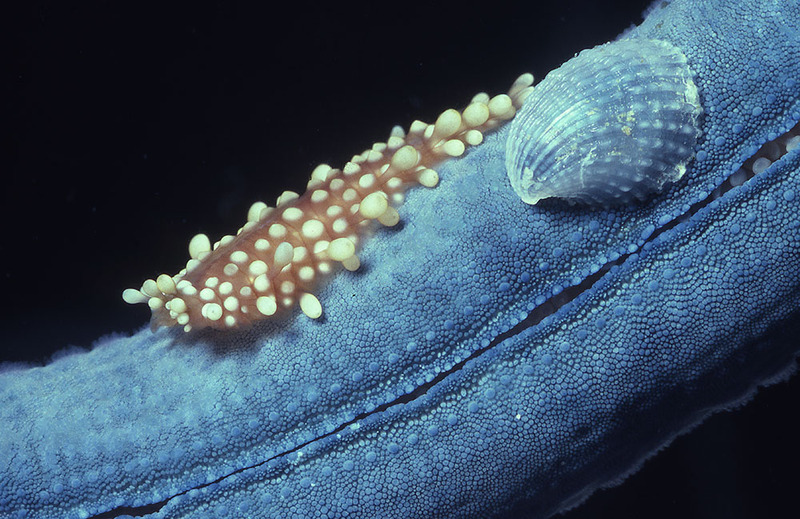 WORM 1017 Asterophilia carlae Sea star scale worm on Linckia seastar, Fiji. 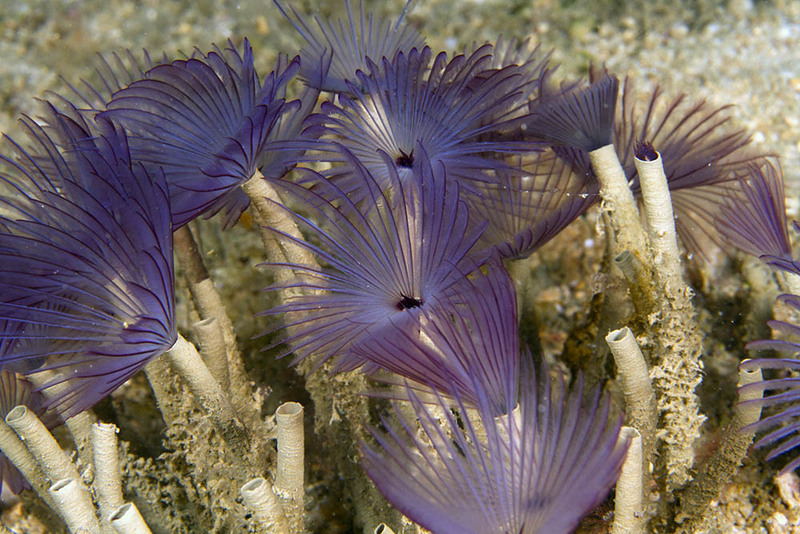 WORM 8517 Possibly Bispira species Featherduster worm Kri Eco, Raja Ampat. 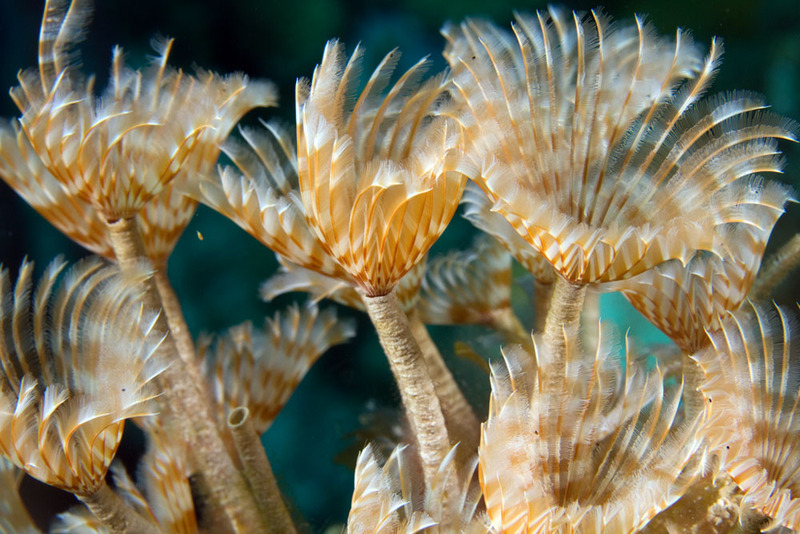 Branchioma nigromaculata Spotted feather duster worm from above, Belize. 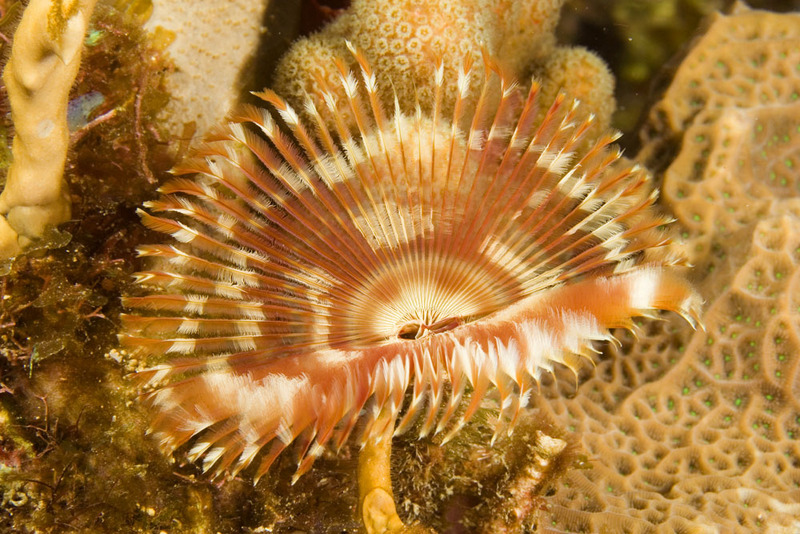 Branchioma nigromaculata Spotted feather duster worm three-quarter view, Belize. 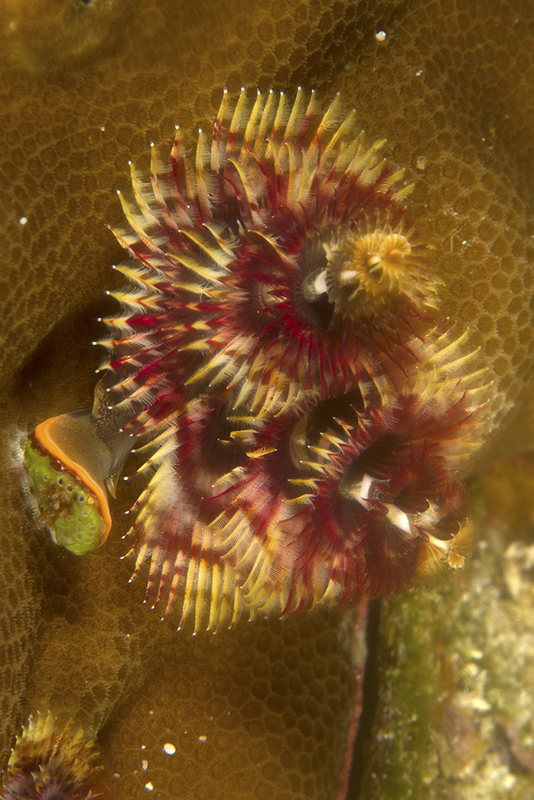 Branchioma nigromaculata Spotted feather duster worm side-on, Belize. 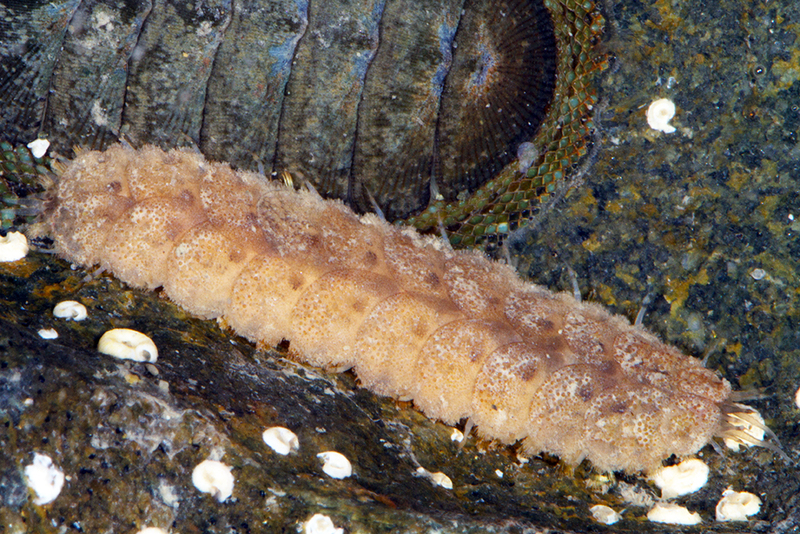 WORM 6322 Chloeia species, Lembeh Straits. 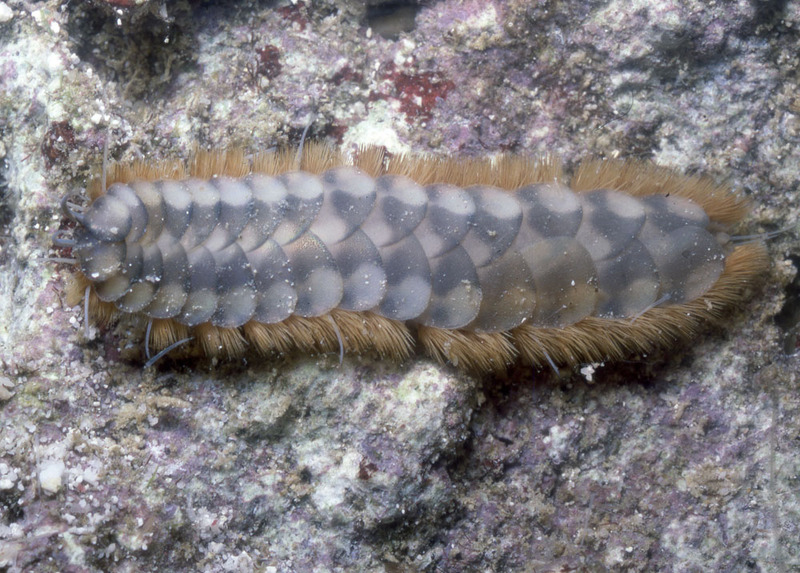 WORM 2733 Ostensibly this is Eurythoe complanata Common fire worm, Sea of Cortez - but this may be a mis-identification. 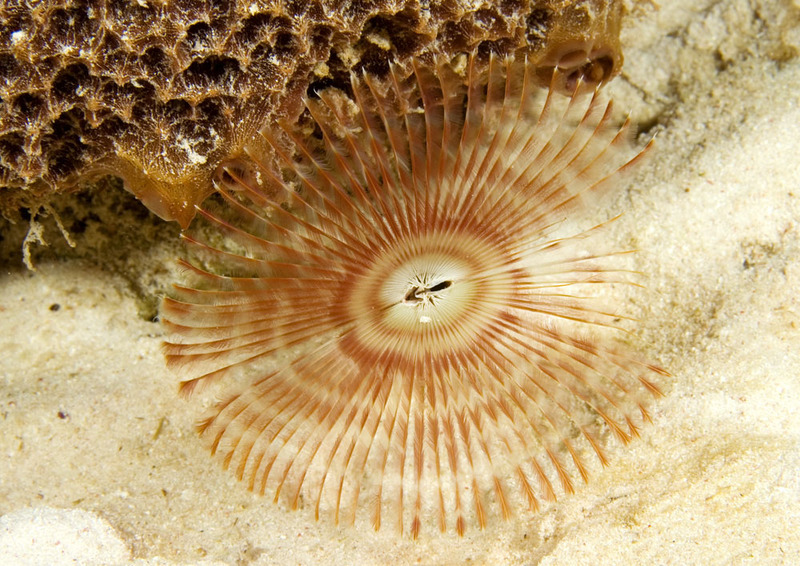 Hermodice carunculata, bristle worm or fireworm, Cozumel. WORM 8146 Filogranella ?species Puerto Galera, Philippines. WORM 8148 Filogranella? 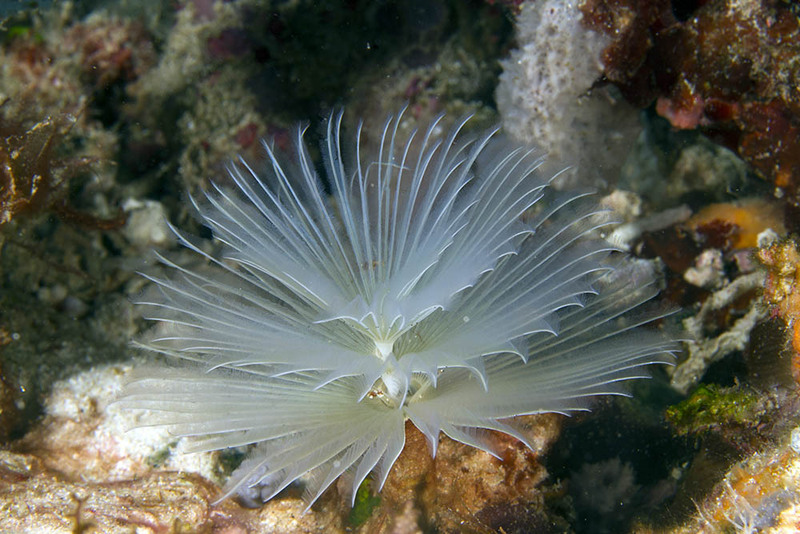 species Delicate tube worm Puerto Galera, Philippines. 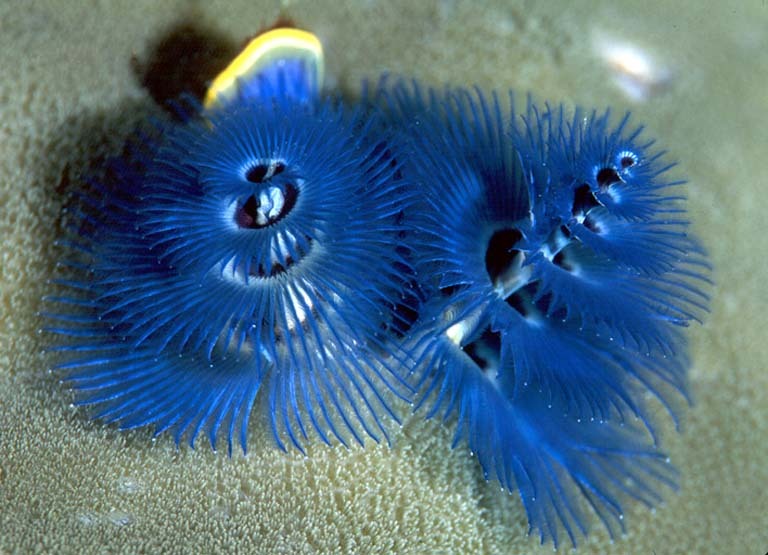 WORM 3884 Loimia medusa Spaghetti worm, Kri, Raja Ampat, West Papua. 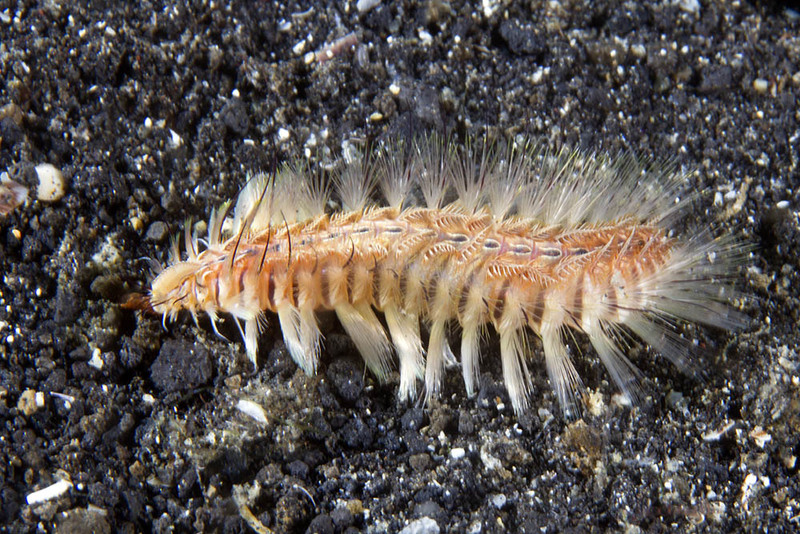 Paralepidonotus species, scale worm, Fiji. WORM 2734 Polydorella prolifera Spionid worms, Raja Ampat, West Papua. WORM 2735 Polydorella prolifera Spionid worms, Raja Ampat, West Papua. 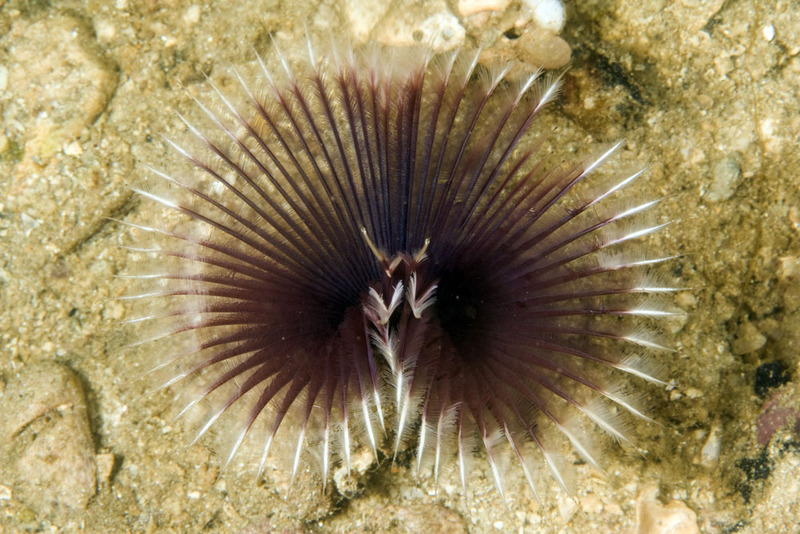 Sabella sp Feather duster worm, Fiordland, New Zealand. 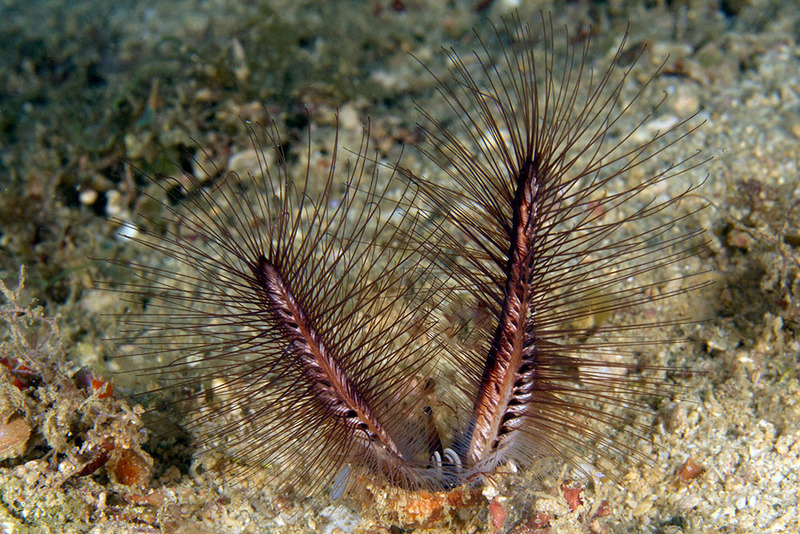 WORM 0490 Sabellastarte indica, featherduster worm, Raja Ampat, West Papua. 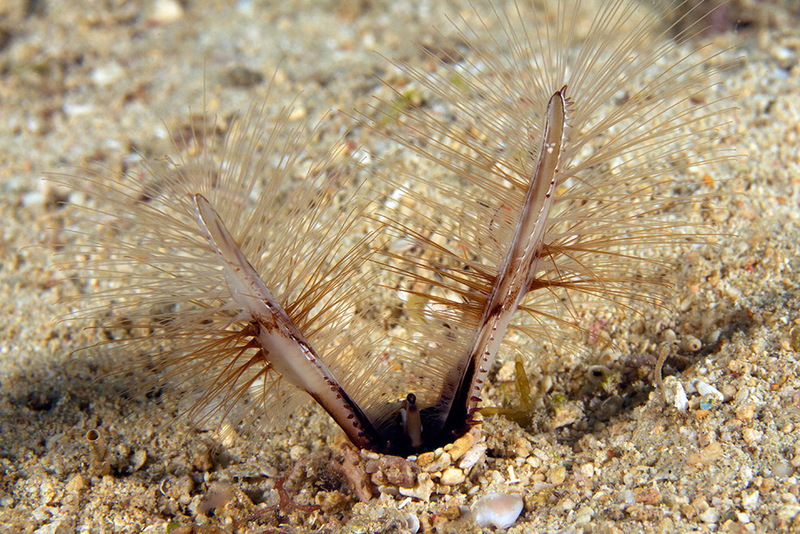 WORM 1504 Sabellastarte indica, featherduster worm, Raja Ampat, West Papua. 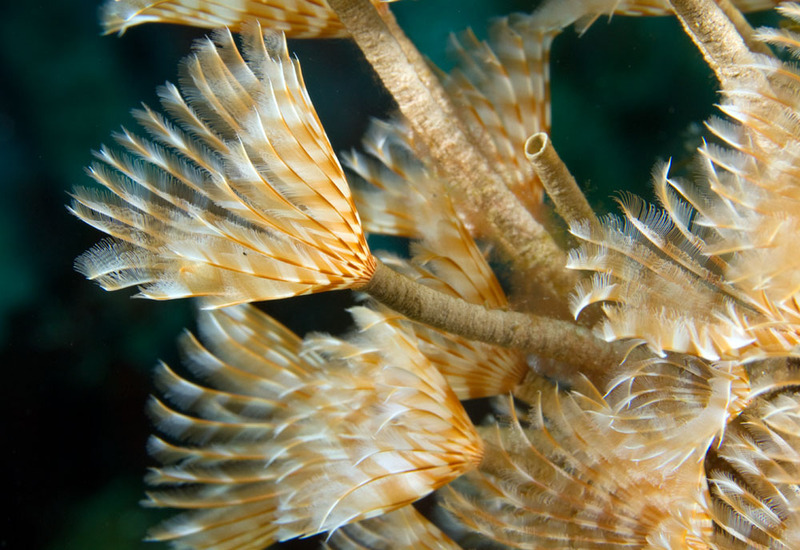 WORM 3307 Sabellid featherduster worms, Glover's Reef, Belize. 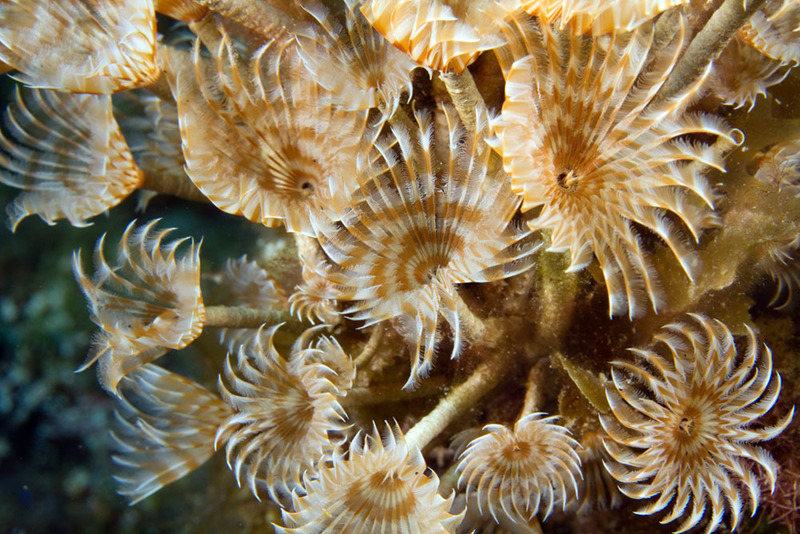 WORM 3306 Sabellid featherduster worms, Glover's Reef, Belize. 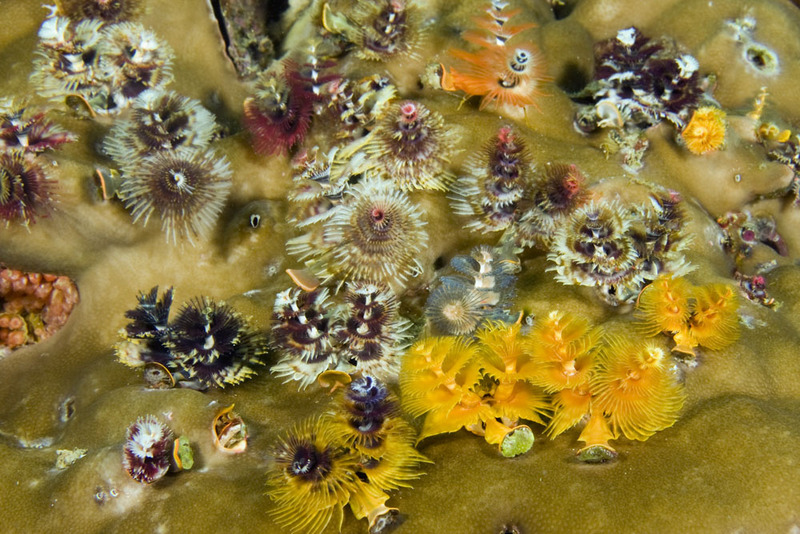 WORM 3305 Sabellid featherduster worms, Glover's Reef, Belize. 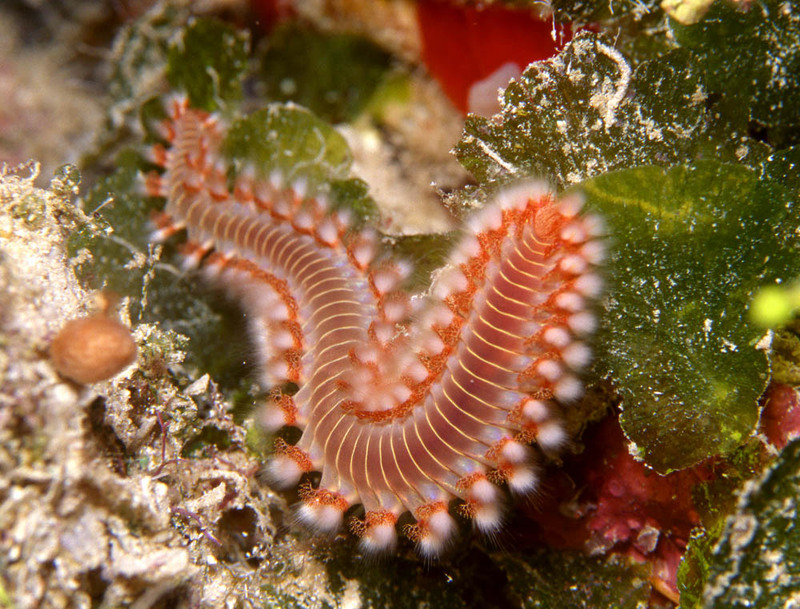 WORM 1246 Serpulid worms, Raja Ampat, West Papua. 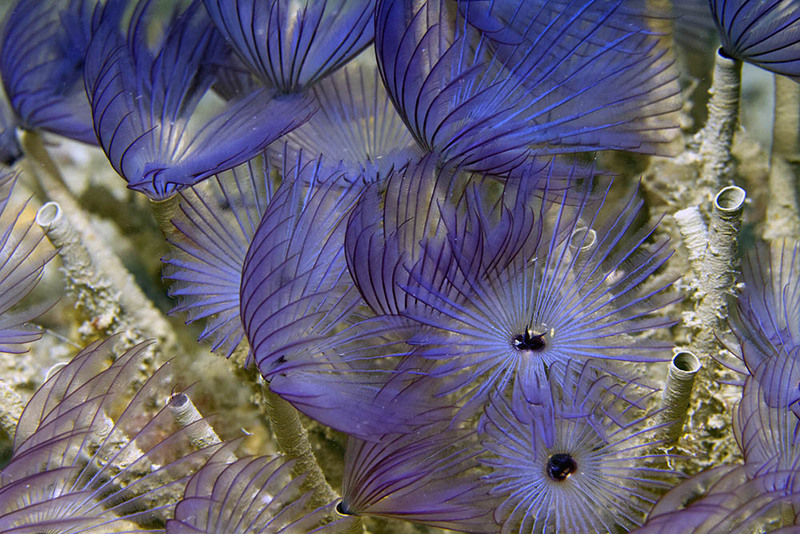 WORM 1247 Serpulid worms, Raja Ampat, West Papua. 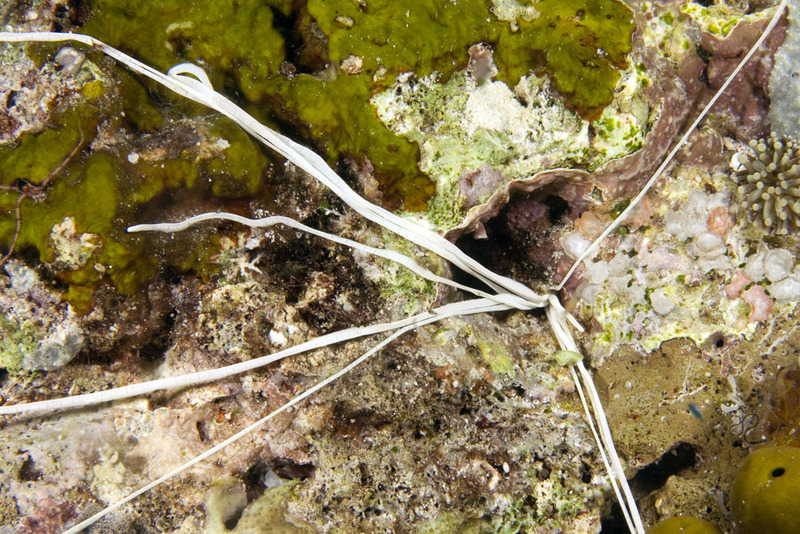 WORM 1912 Serpulid worms, Raja Ampat, West Papua. 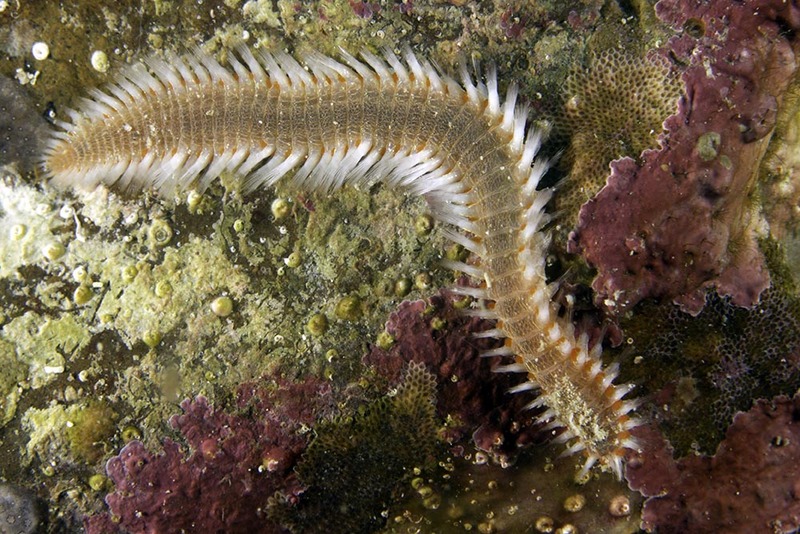 WORM 3155 Spirobranchus giganteus, large group, Raja Ampat, West Papua. 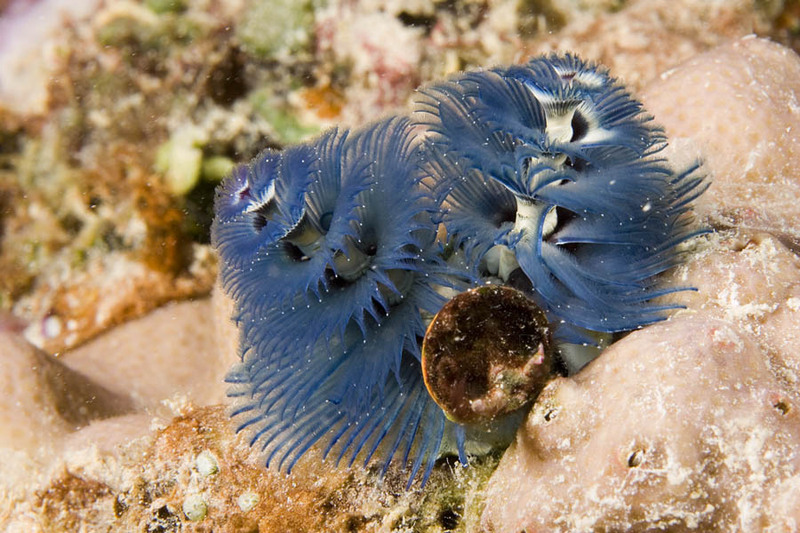 Spirobranchus giganteus Blue christmas tree worm, side-on. 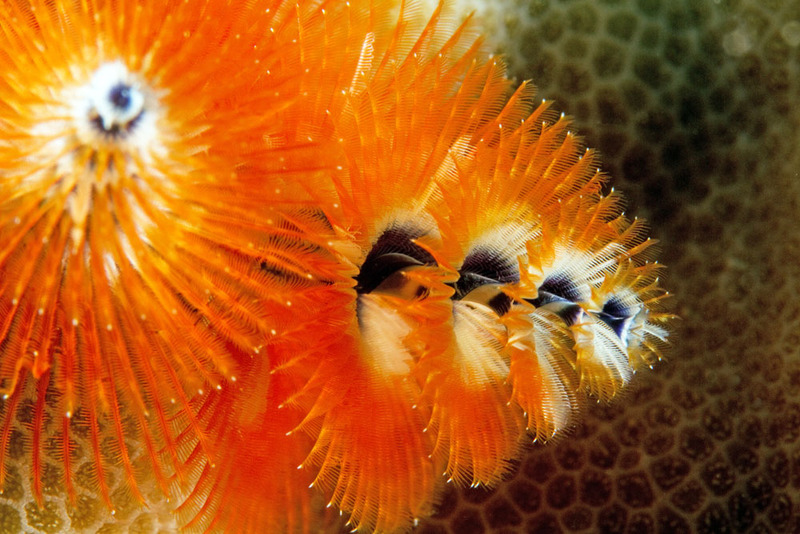 WORM 5026 Spirobranchus giganteus, Orange Christmas tree worm, Taveuni, Fiji. 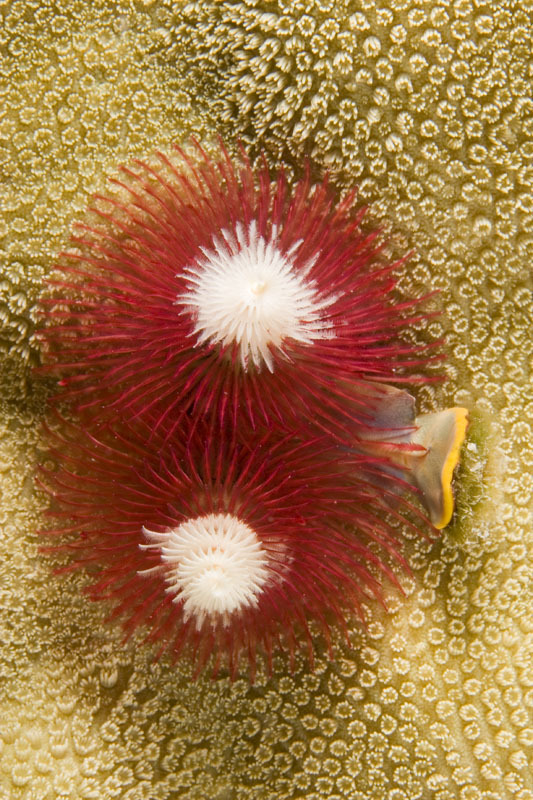 WORM 5028 Spirobranchus giganteus, Orange Christmas tree worm, Taveuni, Fiji. 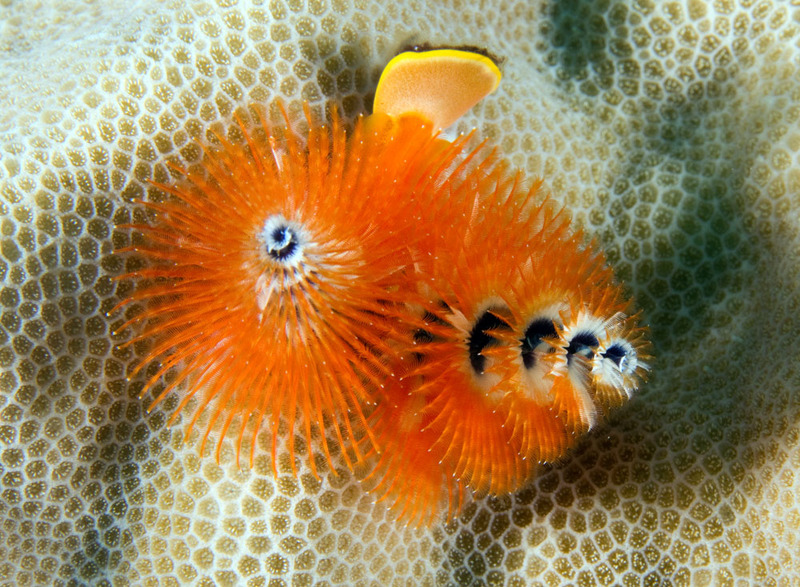 WORM 3208 Spirobranchus giganteus, variegated christmas tree worm, Raja Ampat, West Papua.. 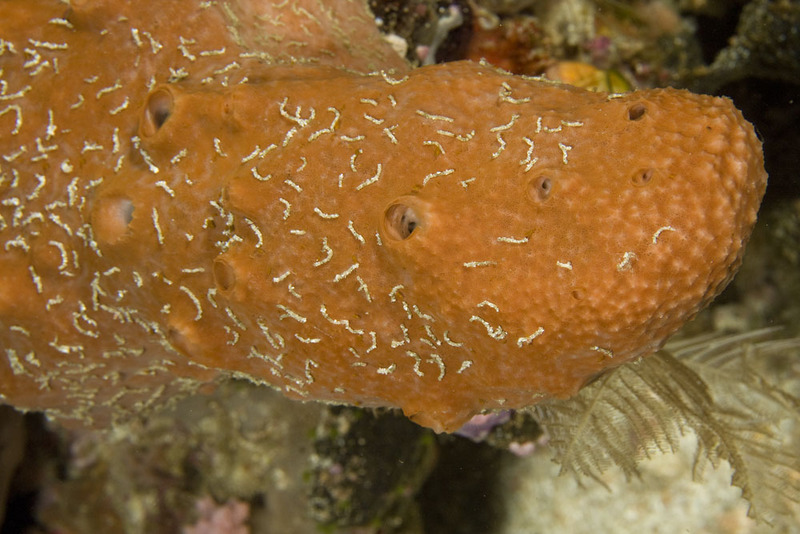 WORM 3156 Spirobranchus giganteus, Raja Ampat, West Papua. 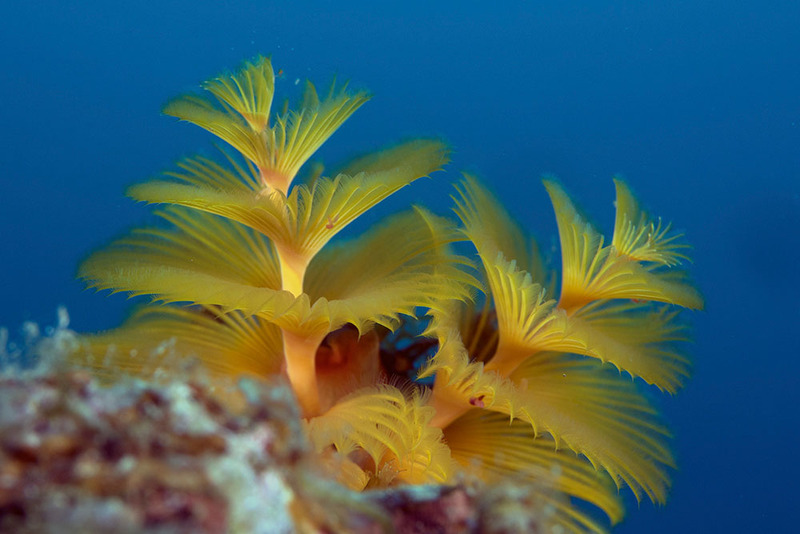 Video and still compilation of Spirobranchus species - this is stored on Vimeo in high def.